Brain Corp, a San Diego-based software technology company, announced today that it has entered into a relationship with Walmart to provide AI services to the world's largest retailer. Brain Corp's BrainOS platform currently automates more than a hundred of Walmart's fleet of commercial floor scrubbers across the United States. BrainOS provides the machines with autonomous navigation and data collection capabilities, all tied into a cloud-based reporting system. Walmart expects to have 360 BrainOS-powered machines in stores by the end of its fiscal year, January 31, 2019. 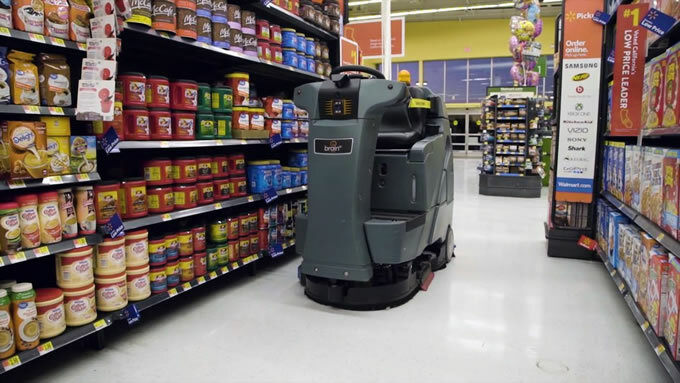 Walmart's BrainOS-powered floor scrubbers allow store associates to quickly map a route during an initial training ride and then activate autonomous floor cleaning with the press of a single button. The robot uses multiple sensors to scan its surroundings for people and obstacles, providing the industry's highest level of safety and performance. "We're excited to work with Brain Corp in supporting our retail operations and providing our associates with a safe and reliable technology," says John Crecelius, Walmart's VP of Central Operations. "BrainOS is a powerful tool in helping our associates complete repetitive tasks so they can focus on other tasks within role and spend more time serving customers." "We are thrilled to partner with Walmart to enhance customer experience at its retail locations," says Dr. Eugene Izhikevich, CEO of Brain Corp. "BrainOS technology allows robots to effectively and safely function in complex, crowded environments, ensuring increased productivity and efficiency across applications. We look forward to continuing to work alongside Walmart to help build intelligent, connected stores." BrainOS® is the foundation of Brain Corp's technology platform. It is a proprietary operating system that integrates with off-the-shelf hardware and cloud technology to provide a cost-effective "brain" for robots. BrainOS has computer vision and AI libraries that enable quick and efficient development of smart systems that learn and adapt to people and complex environments. Its navigation stack provides advanced self-driving capabilities for cluttered and dynamic indoor environments.